If temperatures remain high and rainfall remains minimal, we must consider the possibility of drought. A striking example was in 2003 where there were above average levels of water in the Kettle River in the spring but as high temperatures and low rainfall persisted throughout the summer, a drought was experienced partnered with a large number of forest fires, particularly around Kelowna. This is a lesson that cannot be forgotten. 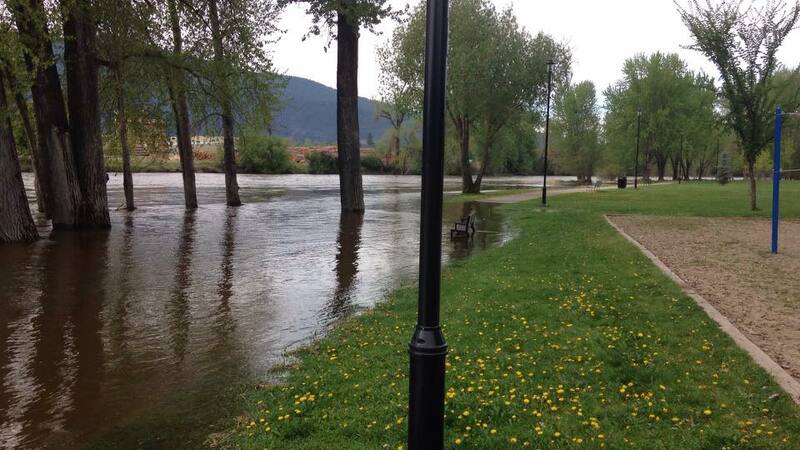 Although there are high water levels now, we cannot depend on that to continue throughout the summer. Here at the Kettle River Watershed Management level, we are beginning to work on a drought management plan that will include input from local government water suppliers (e.g. City of Grand Forks, City of Greenwood, Village of Midway, Christina Lake). The water suppliers have agreed that this will be a useful tool for managing drought as a team. Also, this team agrees that education is the main area that should be focused on to conserve water and minimize the impacts of future droughts. Education and water conservation starts with every citizen, farmer, and business owner. Everyone can help conserve water. If watering your garden or lawn, do so at night or in the early morning (60% of water can be lost to evaporation if using sprinklers to water during the day, which equals 6L lost and only 4L making onto your lawn! ); collect and use rain water; install and use drip irrigation to water your gardens and trees; and/or replace your grass with drought resistant evergreens and plants. Every action that we take to conserve water and protect the river will be appreciated by generations to come. Should the City of Grand Forks Councillors have decided to remove the Level 2 water restrictions? Only time will tell. Conserve water and pray for rain. Your new Kettle River Watershed Management Coordinator, Jessica Mace.